COMPANY PROFILE Altria Group Inc along with its subsidiaries is engaged in the manufacture and sale of cigarettes, machine-made large cigars, pipe tobacco, smokeless tobacco products and wine. Altria comprises Philip Morris USA, U.S. Smokeless Tobacco, John Middleton, Ste. Michelle Wine Estates, Nu Mark, and Philip Morris Capital. It holds a 10.5% interest in the world’s largest brewer, AB InBev. Through its tobacco subsidiaries, Altria holds the leading position in cigarettes and smokeless tobacco in the United States and the number-two spot in machine-made cigars. The company’s Marlboro brand is the leading cigarette brand in the U.S.
A company’s earnings should not be taken at face value. By that we mean that we should look deep into the accounts to gauge the probability that the company may be relying on account techniques to boost earnings. A company that has been showing strong profit growth or is expected to do so usually trades at a high valuation. This may put tremendous pressure on management to announce good growth to the extent of resorting to accounting techniques to do so. On the other hand, a company that is struggling to report growth in its business may also rely on accounting techiques to boost earnings. These methods will catch up with the company one day and when that happens there is usually a large negative earnings surprise and share price decline. 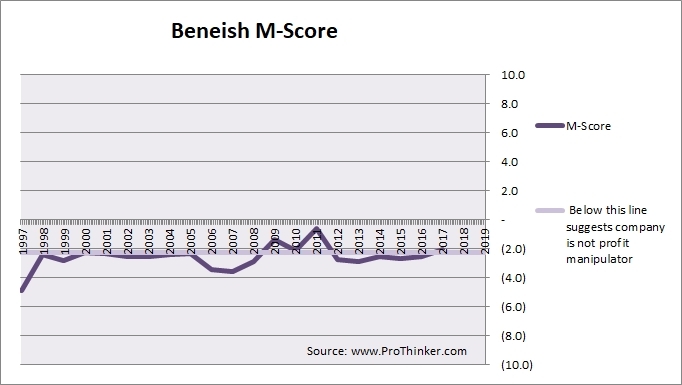 To detect the likelihood of earnings manipulation, two commonly used methods are the Beneish M-Score and the Sloan Accrual Ratio. Since it is difficult for one ratio to catch all occurences of profit manipulation, we put the two scores into a composite to have a better chance to spot earnings manipulation. A score of less than -2.22 suggests that the company is not a profit manipulator and a score above -2.22 suggests that the company might be manipulating its profits. 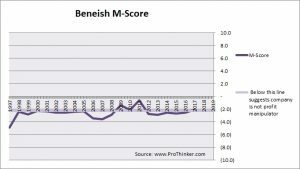 M-score has been deteriorating since 2013. The latest M-Score of the company as at Dec 2017 was -2.04, which suggests that the company might have been manipulating its profits. 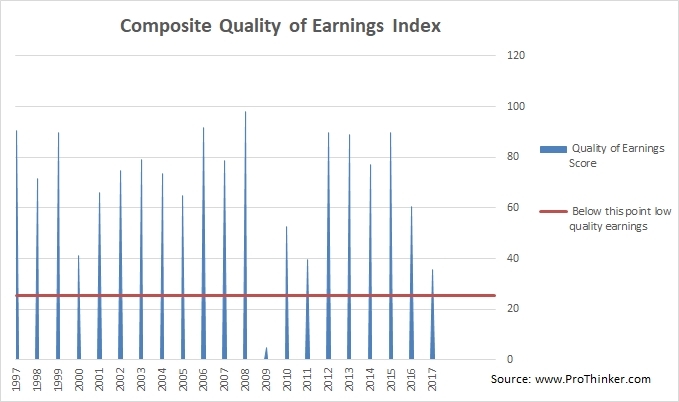 Earnings with high accrual (or non-cash) component are more likely to be reversed in future resulting in earnings disappointment and share price falls. 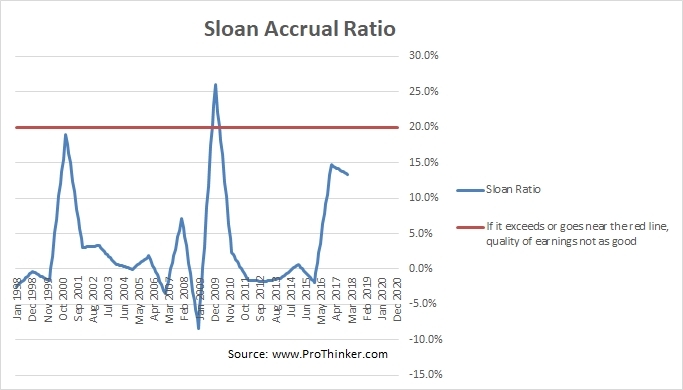 The latest Sloan Accrual Ratio is negative. Since it is not possible for one indicator to capture all instances of earnings manipulation, ProThinker employs both methods to arrive at a Composite Score of the company’s earnings quality. A score of 25 and below (the red line) indicates a higher probability that earnings may have been manipulated. The quality of the company’s earnings is low and there may be a possibility that profits are inflated. 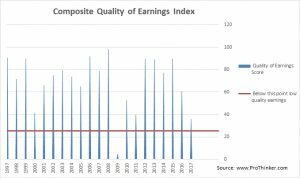 Determining the quality of a company’s earnings is important because artificially inflated earnings will one day lead to earnings disappointment and share price decline. In order to derive at a fair valuation of a stock, we need to factor in earnings forecasts that are free from manipulation. These earnings estimates are then multiplied by an appropriate PE for the company. 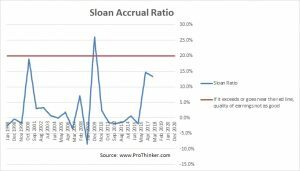 Having said that, we should not be relying on PE alone and should be using other valuation indicators to calibrate our forecasts.